It’s the game everyone’s talking about this month; the one that heralded the end of E3 and, amidst shout matches about Playstation 4 vs. Xbox One, managed to capture everyone’s attention. It roared on to the scene amidst a sea of perfect 10 reviews from reputable gaming websites and did so well in its opening weekend, it topped Man of Steel. This is The Last of Us. I almost wish I hadn’t heard so much buzz about the game before it came out. It’s more difficult to be objective about reviewing a title when you’ve been slapped in the face with the “it’s perfect” stick so many times you’re expecting it to be mind-blowing. I popped the game into my PS3, settled down into the dark, and was crying within half an hour. 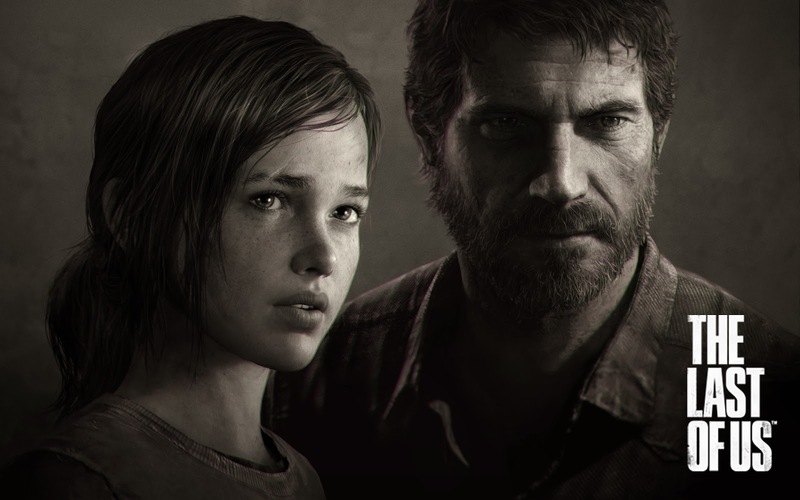 The Last of Us, first and foremost, is a game about mankind. Set aside the mechanics, graphics, environments, and sound engineering. The world has gone to hell and these people show all the signs of it. Adults who remember how it used to be and have had the hope beaten out of them by a world of danger the likes of which have never been seen. Kids who’ve been disillusioned by the harshness of life and had the opportunity of having a childhood stripped from them before they could even miss it. Those brief moments in which the learned hardness of the new humanity slips away with the glance at a watch, telling of an old story, or spotting of a new toy. And the punitive situations that remind you why being tough is the only way to survive. The Last of Us is impeccably immersive. It’s on the level of Bioshock Infinite, if not more so due to better pacing. The immersion assault is headed by the characters and their dialogue. Naughty Dog has had a knack for very human interpersonal interaction since Uncharted and that trend continues here. 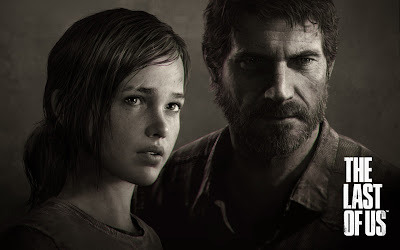 The stoic and intense Joel juxtaposed against the openly emotional Ellie creates believable conversations between a frustrated master and terrified pupil. The questioning of judgment between the two senior survivors Joel and Tess show you right from the get go exactly what is at stake and the state of the world twenty years after a fungal infection decimated the population. And this is all without ever once beating the player over the head with information, rather taking the more subtle approach of having characters talk to one another and allowing the player to read between the lines and imply what they will about these people. The most amazing thing about The Last of Us is not the game, as good as it is; it’s the characters. Another important factor to not breaking the immersion was the blurred line between cutscene and gameplay. They flowed so well into one another it was sometimes difficult to tell I was supposed to move after transitioning from cutscene to gameplay. This seamlessness works to alleviate the problem of becoming aware that you’re separate from the characters by not giving you firm “play now” or “watch now” times though the use of interactive cutscenes, very few quick time events, and revealing important plot details through not only cutscenes, but actual gameplay as well. If you’ve played Uncharted before, you’ll recognize the combat system quickly. The game revolves around encounters in which you must find a way from point A to point B by either sneaking by or killing a number of enemies. This mechanic is fairly standard by now. Crouch behind a box, sneak up behind the guy nobody is looking at, choke him to death, repeat until objective is met. 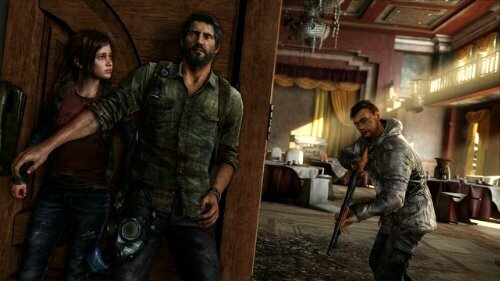 The interesting thing twist in The Last of Us, however, is resource deprivation and increased vulnerability of the player. In Uncharted, you feel like Superman. A very unlucky Superman who can’t seem to find a sturdy metal object to save his life, but you feel empowered against enemies. Charge them with guns blazing, hide and shoot from a distance, punch everyone to death — it doesn’t really matter. Generally. Drake can get out of a situation with the guns with tons of ammo or hiding and regenerating health until the next baddie can be punched out. 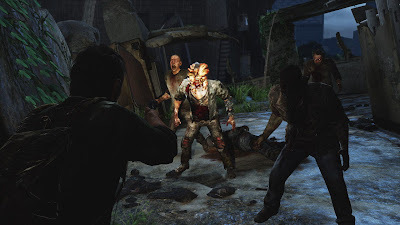 In The Last of Us, Joel is as ill-equipped as he can possibly be, at times relying on the player to find bottles to distract enemies with sounds, or a wooden board with which to melee his opponents. This game takes place twenty years since anyone professionally produced just about anything. It’s safe to say resources are scarce. Bullets are few, enemies are great, and remaining hidden for as long as possible is your best friend. The player must attack each new encounter with wit first and force later. Common questions are “How many bullets do I have?” “When can I attack that guy?” and “Do I have enough resources to craft a med pack?” And no, health does not regenerate. You must either find food or use med kits. The helplessness evoked by scarce resources and dramatically increased danger with encounters is only compounded by the zombies. Technically they’re not zombies, they’re just infected with some kind of spore that turns you into a mindless person looking only to eat other people. These zombies are bad dudes, to put it bluntly. Remember Dead Rising? Dead Island? Hell, even Left 4 Dead? Even the bigger enemies weren’t too big a deal as long as you were fast enough and had enough bullets. 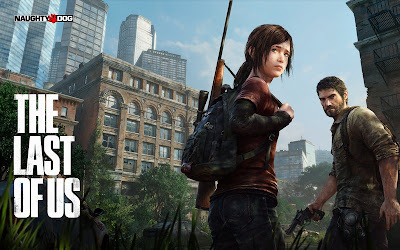 In The Last of Us, there are only three types of zombies—runners which run at you and have melee attacks that can stop you for a few seconds, stalkers who are like runners with one hit kill attacks, clickers which have no eyes and require absolute silence otherwise their one hit kill attacks will have you cursing, and Bloaters who will also one hit kill you but also rip off fungus from their body to throw at you. Delicious. Notice how three of those will kill you instantly on contact? Well, the only one who doesn’t can stop you in your tracks for just long enough to allow others to catch up, and if just one of those is an instant kill zombie, game over man. Luckily, the game allows you to restart encounters instead of levels, encouraging you to experiment with your strategies by allowing you to correct your mistakes quickly and without too much of a penalty. The game does have its problems though. The AI, for one, is horrendous at times. Your companions do their best to follow you, but I often found times in which they were in plain sight of my enemies, and were completely ignored. I think the enemy AI can only recognize the player and not the companions, but that breaks immersion for me and it happens often enough that it’s quite noticeable and definitely annoying. I also found that when pulling up items in my inventory, sometimes the texture for the zoomed in item would not show up for a few seconds, leaving me staring at a really blurry backpack until the game had time to catch up. I’m not sure why that happened, but it seemed noteworthy. Also, any time I chose to save, it always said autosaving was in progress. There was no time in which I chose to save manually that autosave was not in progress, so that’s strange. Seems like a bug to me. Those small issues aside, this game is incredible. The immersion is hammered home by the beautiful landscapes. 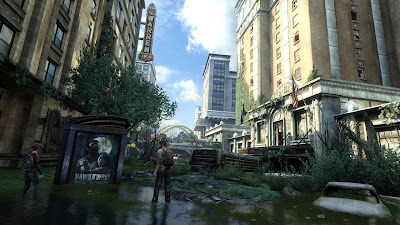 I’ve always had disdain for post-apocalyptic cities because they’re also so grey and drab and generally the same color (looking at you, Fallout 3 and Fallout: New Vegas). The Last of Us takes a different approach to this, having plants overgrow structures to make it look like earth is reclaiming what mankind has built. That visual is a kind of allegory for the whole story — mankind returning to its primal roots when nature reminded it of its place and showed man its hubris. Reading-far-too-much-into-landscape aside, I thought the visuals were stunning. In the same way Mayan temples are overgrown now, so too are modern buildings, streets, and cars. It’s a gorgeous sight and Naughty Dog really pulled out all the stops for the details in this game. The sound engineering is also quite subtle. The music all follows the same sort of theme with alterations depending on the mood and scenario, but it’s rare to hear it. Mostly, the sound is taken care of by the environment and audio indicators to give you hints on what to do. For instance, instead of having a bar on the screen that showed you how visible you are to an enemy, instead a rumbling noise is heard and if it goes on long enough, you’ve been spotted. It’s a great indicator that allows for less screen clutter while still having intuitive information feedback. The weapon effects and encounter noises all sounds as intense as it looks, allowing the visceral action of combat to be that much more believable. Believability seems to be a common theme running through every stage of development of this game. Verdict: Is The Last of Us perfect? Certainly not. Immersion was broken too often by both the companion and enemy AI for it to be perfect. But was it incredible? Absolutely. The game comes in strong with its true-to-life characters that you can relate to on a deeper level than most games and really root for them to succeed. Pair that with stunning visuals, sound engineering that gets out of your way, but really lets you feel like you’re part of the fray, and a story that’ll be difficult to top this year, and you have Naughty Dog’s latest title. 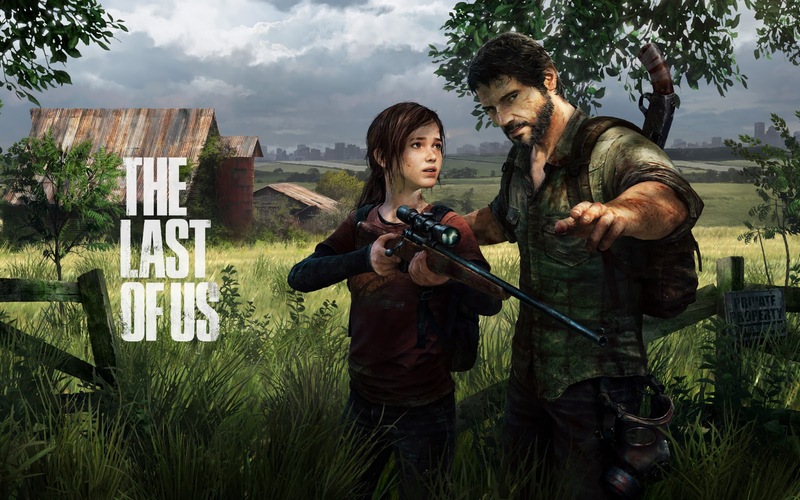 It’s not often that a game can live up to the hype, but The Last of Us sincerely blew me away.